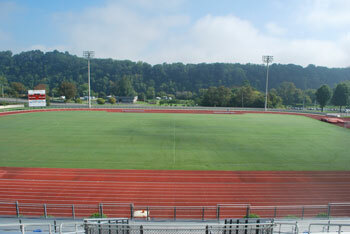 Patrick D. Cupp Memorial Stadium was completed in 2003 and quickly became one of the premier soccer and track and field stadiums in the Southeast. 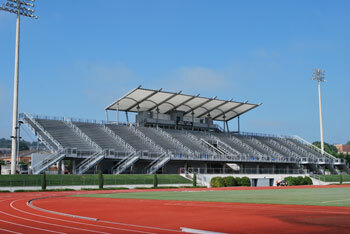 The largest soccer/track facility in the Big South Conference, Cupp Stadium has seating for 5,000 spectators. Four large locker rooms, an on-site athletic training room, and a dedicated laundry room highlight the amenities for student-athletes and teams. The facility also includes a large, fully functional press box with dedicated storage and restrooms. Standard phone lines wireless and hard-wired internet connections were installed to serve all possible media needs. In addition the press box houses the stadiums leading edge scoreboard controls and sound system. In addition to the game-day amenities, Cupp Stadium serves the day-to-day needs of the soccer and track and field programs, all of which have offices inside the complex. The stadium also incorporates offices for RU's field hockey, men's and women's tennis and golf programs. The soccer surface is a Bermuda blend natural grass field. A state-of-the-art drainage system was recently added to assist in keeping the field in top shape year-round. The track is a synthetic surface divided into eight lanes. The stadium also includes jumping and vaulting pits.